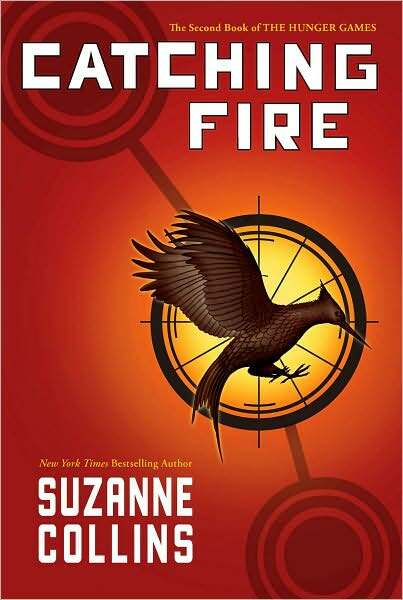 If you follow me on Twitter, you know that last night, I read Catching Fire by Suzanne Collins, and immediately bemoaned the idea of waiting another year for the next book in the series. I mean, there’s ending a story and being curious to know what happens next to these characters we’ve grown to care for, and then there’s leaving things with a big ole cliffhanger, and driving your fans nutso. Anyway, it made me think of other books where I’ve decided to wait until a series was complete before starting to read it, purely so I didn’t have to deal with that agonizing waiting period. Everyone keeps telling me to read George R. R. Martin, for instance, but if the books are as good as everyone says they are, I want to wait until I can read them all, one after the other — though I imagine I’m going to have to devote a whole month to the effort. It also reminded me of why I say your manuscript — even if you envision your book as the start of a series — really needs to stand on its own. You don’t want to piss off a reader by getting them to the end of a book and then pulling the rug out from under them, saying, “Sorry, buy the next book for the conclusion!” Nobody likes an angry mob with pitchforks, and if you don’t think readers get mad when you mess with their favorite characters, you haven’t been paying attention lately! What book series have you decided to hold off on, in order to know they came to an end, and which books do you wish you waited to read, so you didn’t have to deal with a cliffhanger? Also, don’t forget, leave a link to your review of Catching Fire in the comments in order to win a copy of Band Geeked Out by Josie Bloss! ← Ask Daphne! Who Should Contact You? My teaching staff at the junior high is also bemoaning the wait. Having chatted with Ally Carter, another of my favorite authors, about the extreme effort she puts into editing, I find some solace in the fact that the wait equals a quality book. I'm not saying I'm being patient, by any means. Quote of the day: "Nobody likes an angry mob with pitchforks"
Even Suzanne Collins follows that advice about series, at least with respect to first books. Both Hunger Games and Gregor the Overlander could have stood on their own reasonably well. I have recently gotten my new roommate into THE HUNGER GAMES and now she's onto my old ARC of CATCHING FIRE. I told her that I haven't been this excited for the next book in a YA series since HARRY POTTER. Yes, since HARRY POTTER. Which says a lot, since HARRY POTTER took up 10 years of my life. Why isn't it 2010 yet???? My review of CATCHING FIRE is here. Actually I was glad that I waited to read the Mortal Instruments series until after they were all out. As much as I loved the books, the characters, the world, and the series as a whole – I definitely felt like I was left hanging at the end of the first book! I had to wait a few days to get the second and third from Amazon, and I was not a happy camper. Two that really bothered me – Linda Evans' Far Edge of Darkness, which is clearly the first book in a series and she never wrote the next! Those poor people have been falling into the Seine for – what, 13 years now? The other is Duainfey by Sharon Lee and Steve Miller. I _love_ most of their stuff, so I grabbed Duainfey as soon as I could – and then found that it just sort of stopped. No conclusions, no even temporary safe place for either of the protagonists – for that matter, by the end of Duainfey they hadn't even _met_. Lots of story but no sort of ending. I haven't managed to read Longeye, which completes the story, yet, largely because I was so disappointed by Duainfey. I will read it, eventually. But that is definitely one book cut into two random pieces. They've done successful cliffhanger sort of endings before – I felt no great pain waiting for Carpe Diem, although the previous book (Agent of Change) had them making a hyperspace(ish) jump in a crippled ship under crisis conditions – they'd escaped that problem, the next set could wait. But Duainfey just didn't work for me. Note that I'm a lot more upset about Duainfey, because I like and trust the authors, than I am about Far Edge of Darkness – although it is a case of once burned twice shy. Even writing with David Weber, I'm not reading a Linda Evans again until the series is complete (and maybe not then). The series that I wish I had discovered after the last book was published is Diana Peterfreund's Secret Society Girl series. I had to wait for the last two and it was pure torture! Getting to the end of Catching Fire left me with more questions than answers so yeah, I'm a little frustrated about having to wait a year for the next book. I love the Percy Jackson series by Rick Riordan. I think he did a good job of satisfying readers with each book but still leaving something to anticipate with the next. Like with Catching Fire, I was there the day The Last Olympian came out. Only with the Percy Jackson book I had to fight with my 9-year-old for a chance to read it! George R. R. Martin's "A Song of Ice and Fire" books are ones I probably could have waited to read. I only read the existing books last year, so it's not as though I've been waiting from the beginning, but still. The last book didn't even touch on several of my favorite characters. I'd say that C.E. Murphy's Walker Papers series works very well. Each book can stand on its own, but the series is very cohesive as a whole. And no cliffhanger endings that make me want to rip out my hair! Yay Daphne for catching up on all my favorite books! Next September feels so far away! Yay Team Peeta!